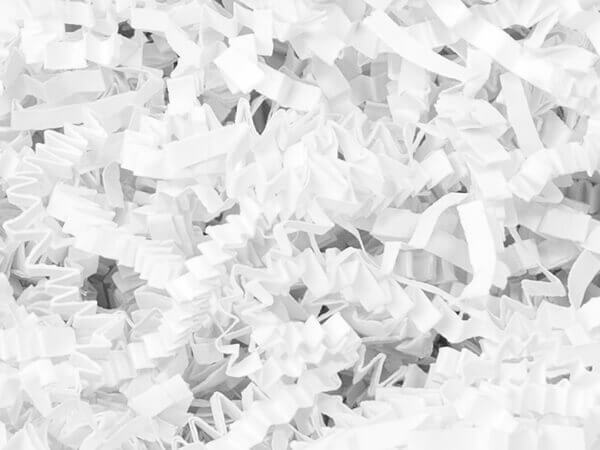 Solid White Crinkle Cut™ Paper Shred (Zig Fill) is great for all occasions including weddings. Actual shred size is 1/8" and sold in 8 oz. bags. 100% recycled papers. Green Way® Eco-Friendly Packaging. Made in the USA. Shredded paper in vibrant and traditional colors is available in convenient 8 oz. bags and expands in volume. This strong shred is highly recommended for medium to heavy weight items. We offer these shreds in solid colors, metallic colors, iridescent colors and blends . Each shred is approximately 1/8" wide.